My Apple Watch arrived a little less than a week ago. I bought it with hopes that it would be a great tool to compliment my use of other technology in my physical education classes. I was also hoping it would help me in my journey toward exactability. So far, it seems to be meeting my expectations. Decreasing management episodes and increasing opportunities for student engagement are just a few ways the Apple Watch is helping me as I attempt to become a better teacher. It’s important to note that most apps for the Apple Watch are extensions of your iPhone, meaning the Apple Watch can’t do a whole lot without your iPhone. Here are my early impressions of a few applications that I see as very useful to help physical educators with their job. The Remote App is an application that allows you to connect your iPhone and now your Apple watch to your iTunes library located on your computer. I have used the remote app frequently over the years but really like the fact that I can now control my music from my watch. When using the remote app you will need to plug your desktop or laptop into a stereo system or PA system. The Apple Watch allows me to start and stop music very quickly without having to reach for my iPhone. It makes a task that is already part of what I do on a daily basis easier. Known Limitation: You cannot search through songs in your iTunes library or switch between playlists on the Apple Watch; however, you can go through the songs on the specific playlist you are currently playing. If you want to change playlists or skip to a song not on your current playlist, this is when you would need to bring out your iPhone to make your adjustments. I often have my Apple TV hooked up to my PA system and projector. Using my Apple TV allows me to control my music from my iPhone directly through my Apple Watch. Apple Watch has something called glances, which allows you to quickly scroll through specific applications that are on your watch. One of the glances allows you to control the music that is now playing on your iPhone with your Apple Watch. If your Apple TV is paired with your iPhone, it will stream your music over whatever device your Apple TV is plugged into. This glance works with Pandora or FIT Radio; however, FIT Radio let me know that they are currently working on an Apple Watch App. Know Limitation: The Apple TV will rarely continue to play music if you turn off your iPhone screen. I recommend you turn the auto lock option off on your iPhone to ensure the Apple TV and your phone do not loose their pairing. The Keynote App also has a remote feature. I have been able to successfully use this to change slides within my class from my watch. Here are the steps you need to follow to set this up: 1) Pair your Apple TV with your iPhone or plug your iPhone into a projector, 2) Start a Keynote slideshow on your iPhone, 3) Turn on the keynote app on your Apple Watch, 4) Leave your iPhone on and place it in your pocket if you are using Apple TV or stay close by the projector if it’s plugged in. Known Limitation: I was unable to go more than approximately 20 feet away from my iPhone and successfully run Keynote from my Apple Watch. This problem is solved by the use of Apple TV and keeping your iPhone in your pocket. Using timers in class is a great way to motivate and engage students. There are many different timer apps that you can control with the Apple Watch, and besides just using them to motivate students, you can also use them to help with class flow. I purchased Timers, which is a application specifly designed for the Apple Watch. I have programed the length of each portion of my class so that my Apple Watch beeps and vibrates when I need to transition to the next portion of class. For example, when it’s time to transition from the instant activity to the fitness portion of class, I will be notified. I have found this to be very helpful in keeping me on track and moving through different portions of my lessons. Another way to use this function would be to set the timer for 20-30 seconds and then push start as you begin giving instruction. When it notifies you time is up, then it is time to get students moving again. Know Limitations: You may not feel every notifaction while you teach. I like both of these applications, and both work well with the Apple Watch. If you want to make notes from your Apple Watch you will need to use the voice dictation function. One thing I find helpful with both of these application on the Apple Watch is the ability to view past notes, which allows me to review lesson plan notes from my watch. Know Limitations: Drafts allows you to view all notes while Evernote only allows you to review recent notes. Do Note is an application by IFTTT that helps you streamline your workflow. For instance, you can quickly add an event to your Google Calendar without having to open it by setting up a recipe that causes an event that you voice dictate on your Apple Watch to be automatically added to your Google Calendar. This is great for physical educators on the move. If you have linked your Google Calendar to your iPhone’s calendar this is even better! Known Limitations: You can only have up to 3 “Do Notes”; however, 3 makes things easy to access and use. So far I have not had any issue with the battery life of the Apple Watch and I have used it a lot. Because I use it so much, my battery does not last the full 18 hours but it does get me through the day. After using it to help aid my teaching all day, my battery lasted around 15 hours. Although I haven’t experienced it, some people have reported that their iPhone battery is getting drained. If this happens it would be a good idea to purchase a Jackery Mini Portable Charger and carry it with you. This is just the beginning. 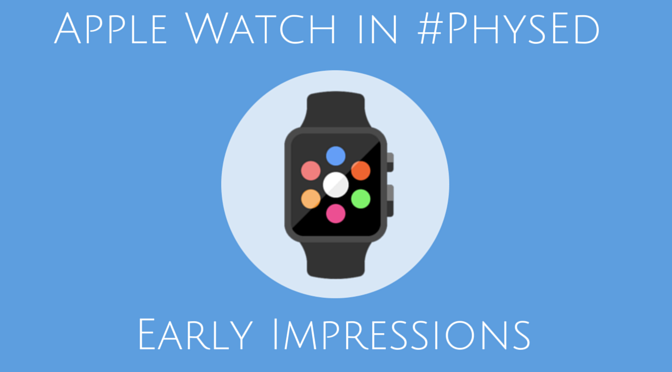 I look forward to seeing how other physical educators apply the Apple Watch successfully in their teaching environment. I would love to hear different ways you plan to incorporate the Apple Watch in your classroom. Excellent suggestions. Answered many of my questions. Looking forward to getting my own very soon. this weblog presents ffeature based articles.